At JMI Limousine we pride ourselves on being the best Portland limo service. We have been in business for over 19 years, and we have always strived to exceed our customer’s expectations. With our strong commitment to safety and customer satisfaction, you won’t find a more dependable and affordable Portland limo service than JMI Limousine. We offer a wide selection of luxury transportation services. If you are planning a bachelor or bachelorette party, we own several Portland party buses than can comfortably seat more than 16 of your friends. We will safely drive you around town as you enjoy the evening with your friends. We also offer a Portland prom limo service. We will safely take your children to the big dance and help make their prom night an enjoyable and memorable experience. We specialize in taking our customers on Oregon wine tours as well. If you are planning a trip to Oregon wine country, but have no idea which wineries to visit and places to see, we can help you. Our drivers are highly experienced and have been trained to give informative and scenic wine tours. They know which wineries to visit, the history of those wineries as well as the most scenic routes to get there. 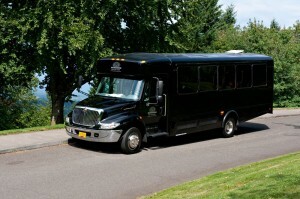 No other Portland limo service can offer such a vast array of transportation services. Our devotion to safety is another thing that our customers are often impressed by. We make sure that all of our vehicles are well-maintained and pass motor vehicle inspections. Our drivers are administered driving skill tests as well as background checks. Our rigorous hiring process ensures that only the best drivers work for us. Our chauffeurs are outgoing, polite and responsible. They are very good at what they do, and will take extra steps to make sure that you are enjoying your Portland limousine or party bus experience. They will get you where you need to be safely, comfortably and on schedule. We are located near downtown Beaverton just off of highway 217. Our headquarters is only a short, 10 to 15 minute drive away from the heart of Tigard. Our customers are always more than welcome to visit our headquarters to meet our drivers and to get a tour of our limo fleet. We will tell you everything you need to know in order to make an informed decision. Contact us by phone or check out our website to get a free quote for our limo service!